Jet lag is very strange. 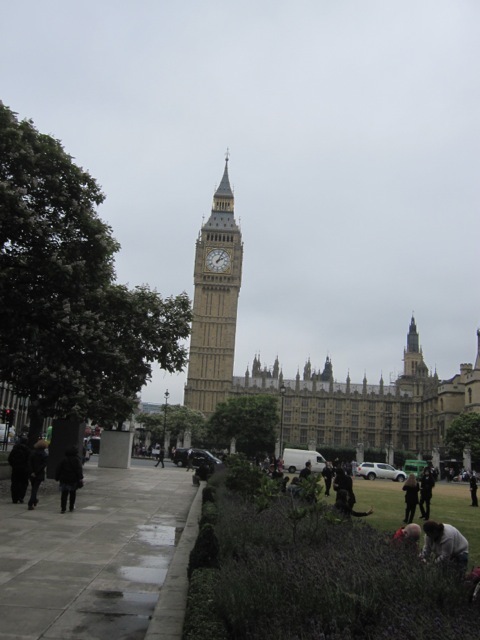 When I went to Hong Kong, and lately England, I was a bit weary in the first few days -- but I adjusted very well. I was able to go about daily business with some energy and enthusiasm -- perhaps it was because I was in a foreign country and excited to be there. However, both coming home from Hong Kong, and now England, I have had a much more difficult time. I slept the first night because I had been up about 20 hours with only a very short nap before going back to bed. I even made it to my book group Saturday night after that nice sleep. But that ended that. The next few nights I woke up every hour or so, and I was super groggy and felt totally off during the day. I accomplished very little except for emptying my suitcases, going to the market for some food after eating three meals of peanut butter and toast, and watering the garden. I did run over to church Monday morning to help Barb Storms count the offering. Thankfully, it was very small, or I would probably have made multiple mistakes. We took care of it in a short while, and I was back home to brood on my lack of any physical strength. It didn't help that after being very healthy and energetic in England, they had a heat wave and I acquired a terrible rash on my lower legs while going through museums and enjoying our last day in London. It didn't itch and it didn't hurt, but it looked gross. It has taken several days to fade away but it, also, took its toll. Good news at last -- Last night I went to bed at 8:00 after falling asleep catching up on programs like Endeavor (I'll have to rewatch it), and I slept completely through to 3:30 a.m. and then from about 4:15 to 8:00 a.m.. Welcome back to the land of the living! I know this is a small price to pay for a lovely vacation in a faraway land. But, I am such an impatient person that I want to right the ship immediately. It takes a great deal of talking to myself to promise just to relax and let the process develop. I want to pick up the projects that I left when I traveled, clean the house, get into my ignored garden, finish painting the dining room, and feel like I have accomplished something. I have made a new rule. I cannot worry about anything until I am home for one week. I guess I'll have time to catch up on my saved television programs and finish reading a novel. I'll have to pretend that I'm still on vacation. I often wonder when I had time to work. At least I'm not going to get a heat rash in Bellingham these days -- and I won't have to water my garden for a few days. I can be grateful for small favors. I have always wanted to go to England, but found my travels to be directed elsewhere. 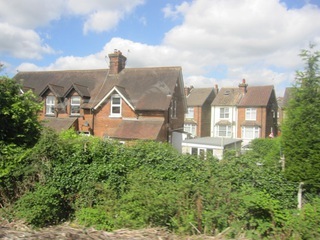 And, as wonderful as those have been, my dream has always been to find a little cottage somewhere in England, stay for at least a month, and roam at will. 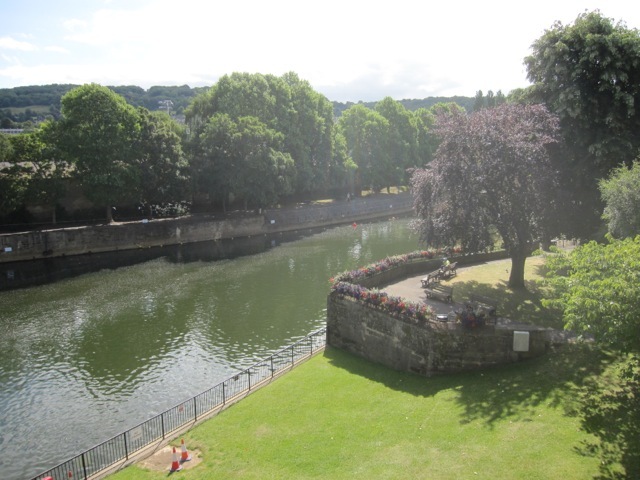 I wanted to get acquainted with the country of my mother's birth and to discover my grandparents home, and reacquaint myself with my mother's British cousins who now live in Wales. 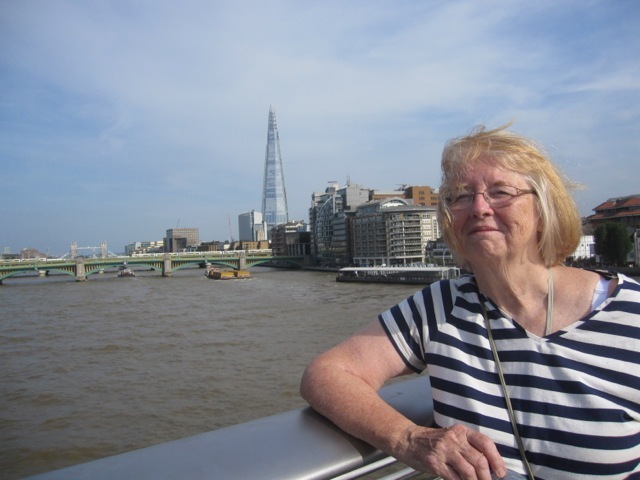 Somehow this has never come to be -- but when Don's niece Connie wrote on Facebook that she would be spending her leave from the Peace Corp in London and invited anyone to join her, I simply responded, "Yes." Several things led to this decision -- I was tired of trying to fashion the perfect England visit in my head, and I had lots of air miles on my Chase card that allowed me to buy a very inexpensive ticket. My thought was, "Why not go and get acquainted with the place?" And, that was my goal. Goal accomplished! 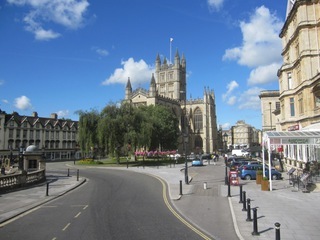 The chance to be in London for four days, travel to another very colorful city of Bath, and to visit with a good friend in West Sussex and see a real castle in a charming, boutique town was the dessert after a lovely meal. This was a whirlwind trip -- if not the travel of my dreams. When I was in Singapore and Hong Kong with Dani and Charles, I lived in their residence and went sightseeing at leisure. In a small way, compared to my kids, I was able to soak up the culture while living in a foreign neighborhood and having a feel for how people lived. Both those countries were unique and memorable -- and I would go back to either in a heartbeat although Singapore was definitely my favorite. I would still like to go back to England for an extended stay and have the leisure to relax more and to see so many other places and sights. However, I am thrilled to get a taste of the country after so many years of dreaming about it. 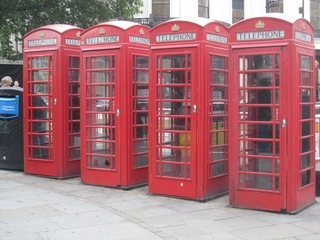 I loved London -- and Dani was right when she said that staying in Bloomsbury near Russell Square was a great central location. My bucket list was mostly filled -- from seeing Westminster Abbey, several museums, some gardens, eating at famous places, learning the fantastic tube and train system, seeing such famous places as Trafalgar Square and Piccadilly Circus, Notting Hill, Charing Cross Road, going to Harrods, going to real British pubs, traveling through Victoria and Paddington Stations -- I got acquainted with so many of the things that I've read about, thought about, dreamed about. Then, going to Bath and Arundel -- both quaint in their own ways -- seeing Roman ruins and a real castle was icing on the cake. There are certainly many things I did not see or do. But, that was ok. 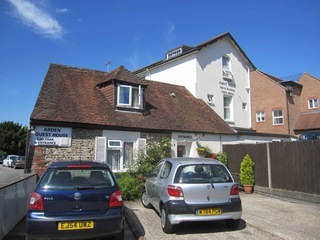 I was pleased with the places we stayed. 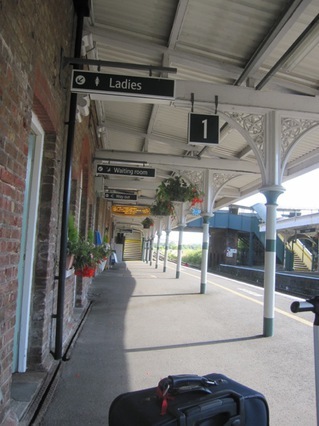 All of them were fairly modest, but friendly and certainly adequate for all our needs. 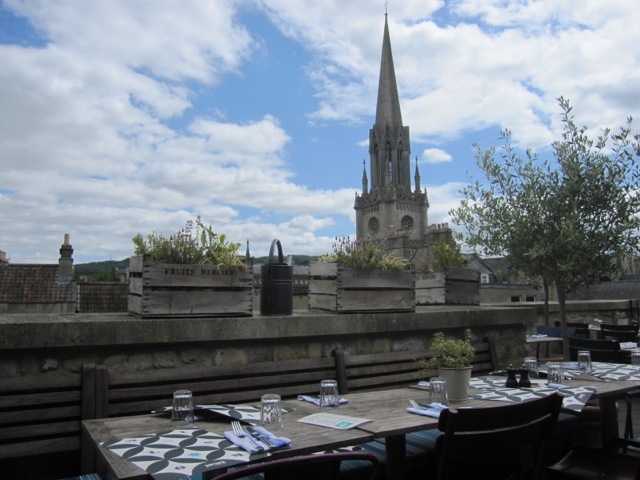 Our place in Bath was the nicest and the Shakespeare in London for our final day was the least comfortable -- but all served full breakfasts and all were friendly and very helpful to tourists. 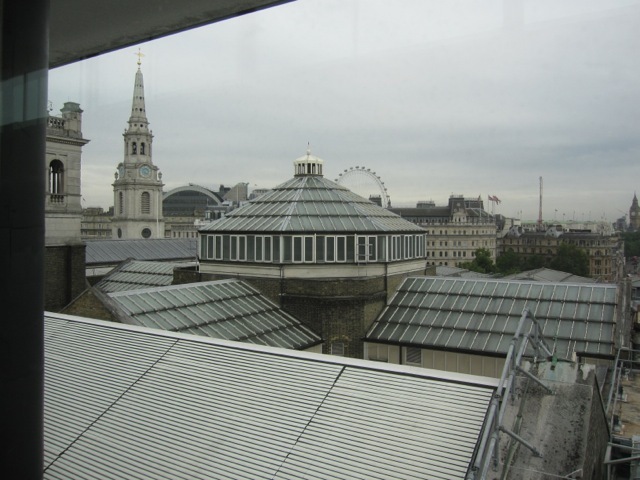 We also met several interesting people while dining -- especially the woman from USC who was now an art dealer in London and talked art with us after our visit to the Courtauld Gallery. Her husband was Swiss and a financier. Then there was the hostess of a restaurant who was from South Africa and had returned the night before from a safari. Those kinds of experiences enhance a trip because they are unforgettable. 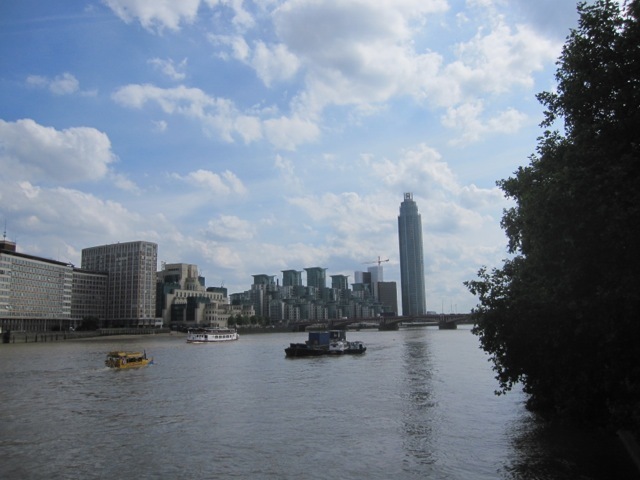 So, in retrospect, I am very glad I finally dipped my toe into the Thames (so to speak). It just whetted my appetite for more. I have some relatives to discover. I chose tea with Cindy and her girls and visiting Hope over traveling to Wales to find cousins -- and that is fine. I enjoyed having my niece assist my travels since she has been all over the world. She probably made some different choices with a more elderly companion, and I thank her for that. I enjoyed hearing all about her adventure in Moldova. She will be there one more year. All in all -- it was a winning experience. I am grateful beyond words. 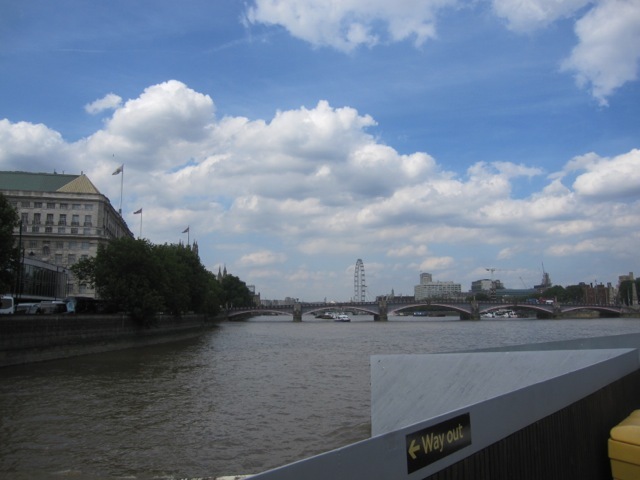 This is for Martin who highly suggested that I take the boat ride on the Thames that travels between the two Tate Galleries. Thank you, Martin, for the lovely experience! 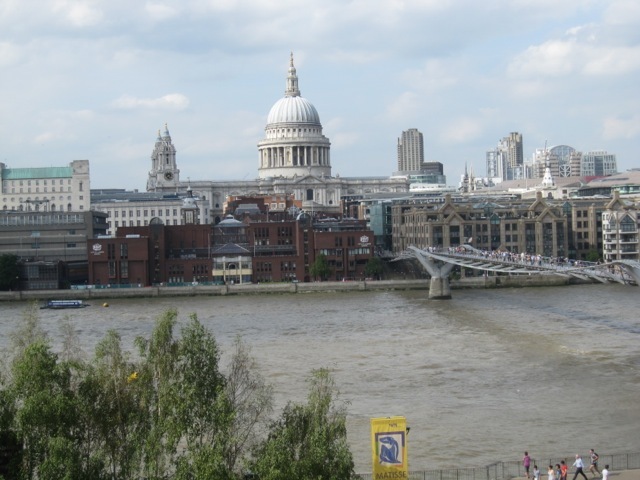 The View From Tate Modern -- We Walked Across That Bridge, Martin! Living Proof! It was An Amazingly Gorgeous Day! A London Heat Wave. 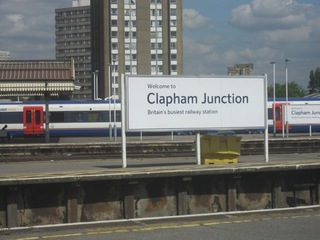 This is for my sister who, like me, has her roots in England but has never visited. 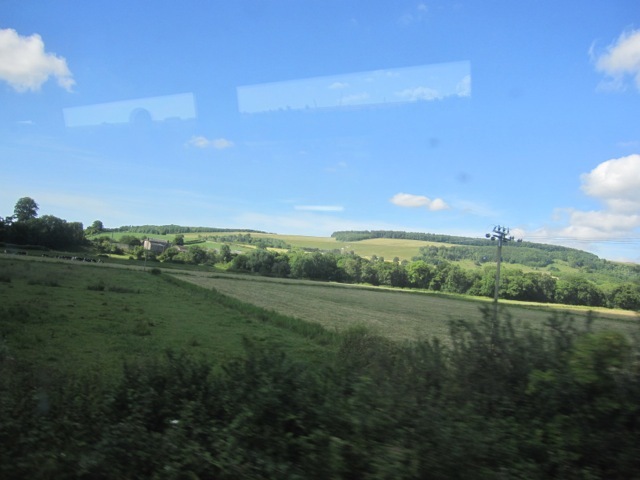 These are glimpses of England from the window of the train traveling between Arundel and London -- just for fun! I will keep this short because I just got back to my room by Paddington Station in a little, rather basic, hotel called the Shakespeare. 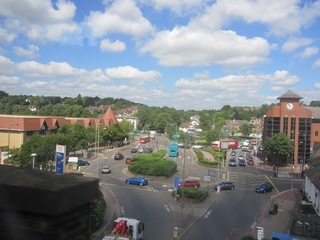 We traveled from Arundel by train to Victoria Station and took a taxi to this hotel because it is near Paddington where I will catch the Express tomorrow morning around 6:30. The hotel will do in a pinch. It has a shower which is most important because it is HOT in London. In fact, it was so hot that I found my legs were covered in heat rash when I undressed for bed. They didn't itch, so I was completely unaware. This has been such a whirlwind trip -- not at all the way I prefer to travel. But, we have seen so much, and I do feel that I know England a little bit which was my intention when I decided to join Connie on her vacation from the Peace Corp. The places we have stayed have been charming, if not opulent, and the people who run them are really helpful. The breakfasts are ample, but really too much. I can only hope that walking from 5-7 miles per day will offset the diet (or lack of one). 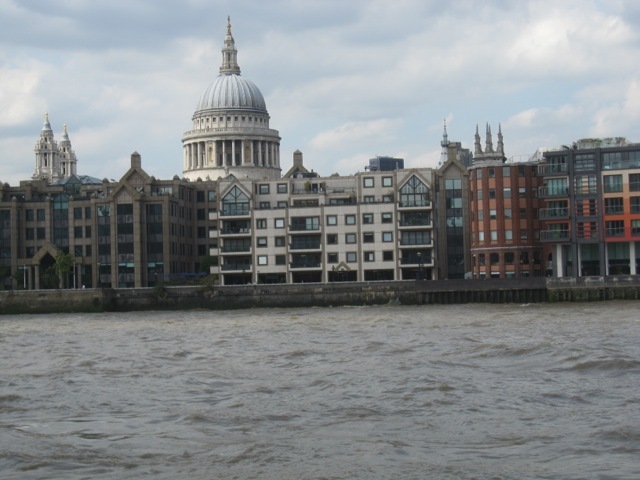 Today after arriving back in London and dropping our bags, we visited both Tate Museums and took the water taxi between which gave us great views of London. 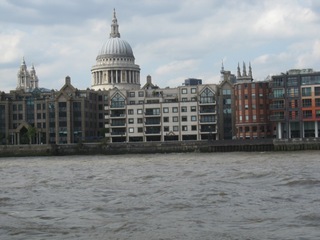 We ate lunch at the Tate Britain and dinner in a restaurant on the Thames across from the Tate Modern. I'm now ready for bed if I can sleep in this heat. Also, I had to pay 2 pounds for wi fi for one hour, so I can't do this very long. I'll post some more shots when I am home -- if I can stay awake. 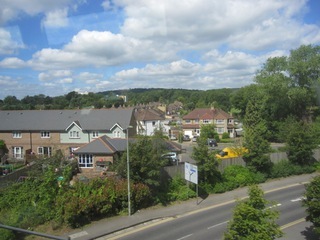 Here is leaving Arundel, arriving in London and two shots in London. 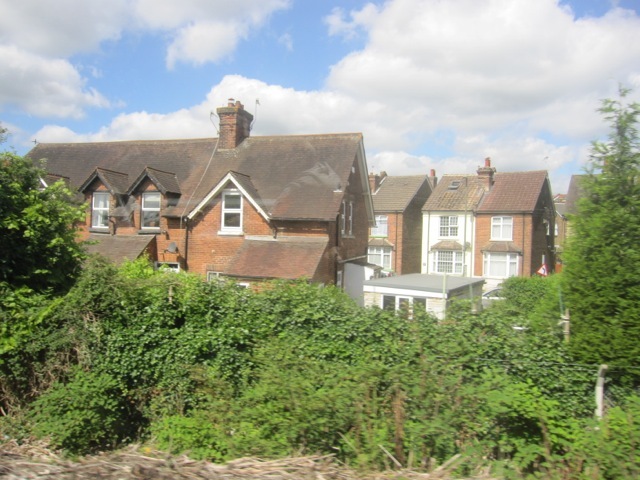 Leaving Arundel -- I LOVE the train system in England! According to Hope, West Sussex is having a heatwave. It is definitely warm, but still breezy and a wonderful temperature for wandering around. And, that is just what we did today. 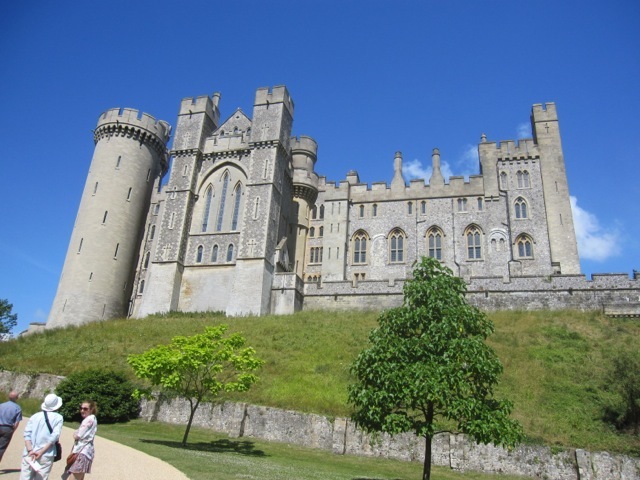 After breakfast, Connie and I were on our computers and just lounging until we were to meet Hope and Grace at 11:00 in front of the Arundel Castle. What a treat. 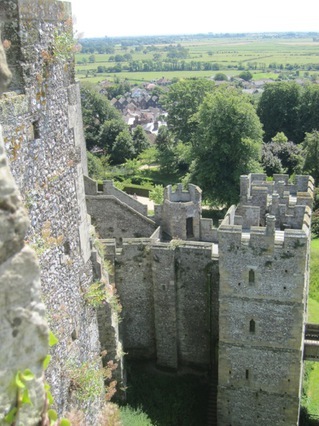 I haven't been in many castles during my lifetime. 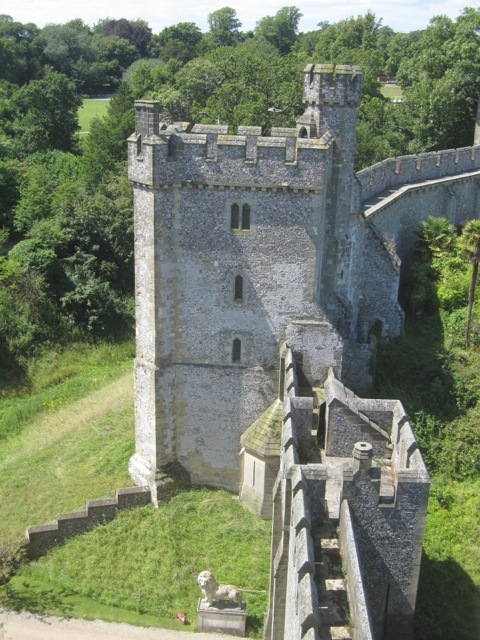 This is really the storybook castle that belongs to the Duke of Norfolk who still lives here (some of the time since he has another castle in Yorkshire). The walking tour (with trams for long distance if needed) takes you through the grounds to the gardens (flower and kitchen), up to the Anglican chapel (there's also one in the main castle), through the ancient ruins of the large and very high keep (or stronghold) of the original castle built in the 11th century, then through the actual rooms of the castle, itself, still in use by the family and guests. For these reasons, often the rooms are closed to visitors. Today they were open. And, pictures were acceptable every place except in the living areas. The place is opulent -- filled with portraits of the family and royalty, lavishly decorated and draped in heavy fabric. The library is impressive with books lining two story walls, comfortable overstuffed furniture and window seats, with elaborate decorations, volumes on display, and paintings on the walls. I wanted to curl up and read with a cup of tea. 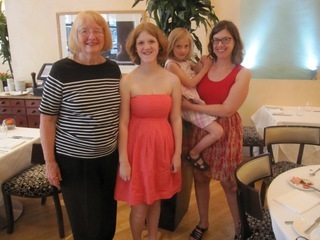 The four of us went for lunch in the cafeteria between seeing the gardens and grounds and touring the house. 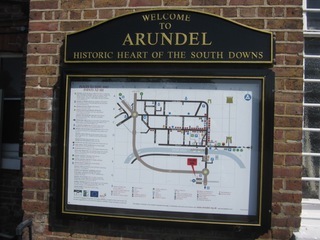 Then, after we finished the tour, we walked into Arundel for a cream tea and scones. 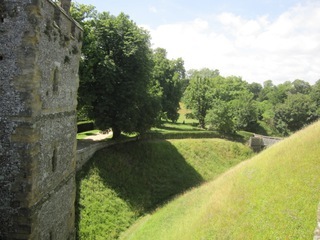 It was wonderful touring with Hope who was so knowledgeable about the castle and the family who occupy it at this time. This particular duke is not as involved with the city as the previous duke was when Hope's family moved to West Sussex. 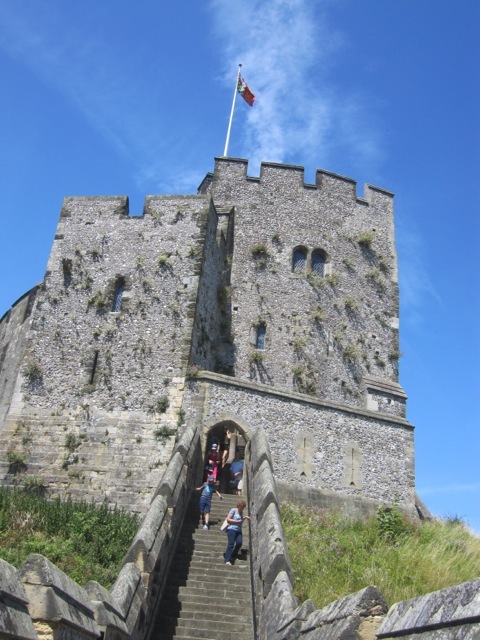 Grace indicated that studying castles is part of the curriculum of the schools and that she had toured Arundel when in the early grades. 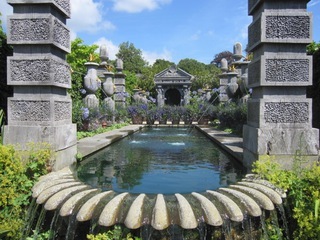 All in all, it was a very enjoyable day which ticked off two more items on my list -- a castle and a garden. How exciting is that? The gardens were quite beautiful -- Italian gardens, a kitchen garden filled with herbs, vegetable gardens, hanging cucumbers in the greenhouse, espaliered apples, and many other lovely garden patches. 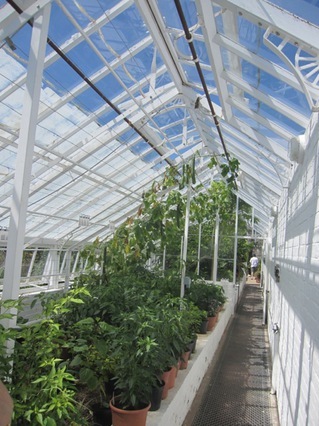 There was an arbor for sweet peas which, of course, was heavenly scented as you walked through the pathway. The chapel is next to the gardens. It is one of two. The other is the family chapel in the castle (no pictures allowed). 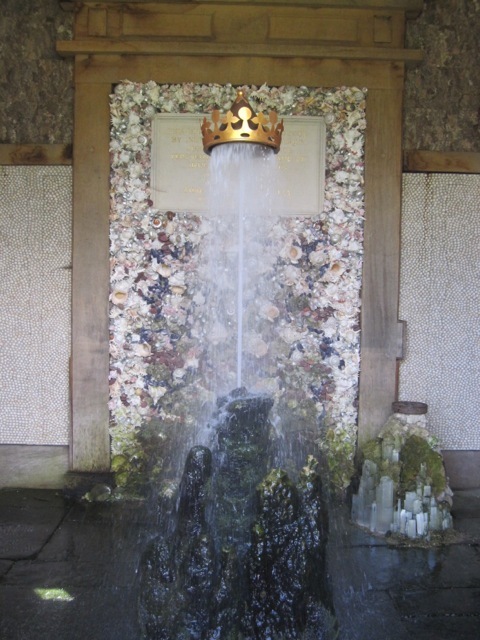 Next to the chapel is a crown held up by a stream of water -- called "the floating crown" and given to the Duke by royalty. Here is the Keep which was also the original castle (and Yes, I climbed all the way up!) 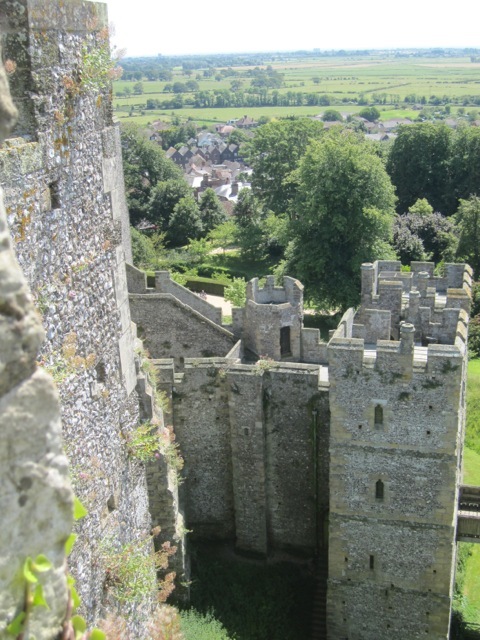 The views from the keep are quite impressive -- of course they allowed the residents to spy on the enemy who might be trying to invade the castle. Our last morning in Bath was enjoyable. 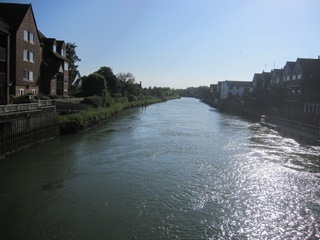 We wandered over the Avon on a bridge that is lined with quaint old shops. While Connie went looking for a Vat form to get back her rebate, I wandered around Bath town and went to Sally Lunn teahouse (supposedly the oldest in the city) to try her famous buns - think half of a very large hamburger bun with lemon curd. I satisfied my curiosity in just a few bites After picking up our bags at the inn, we headed for the train station. The ride to the little town of Barnham took a few hours after which we jumped on the train to London and rode just two stops to Arundel, a lovely, artsy town with a huge castle on the River Arun. 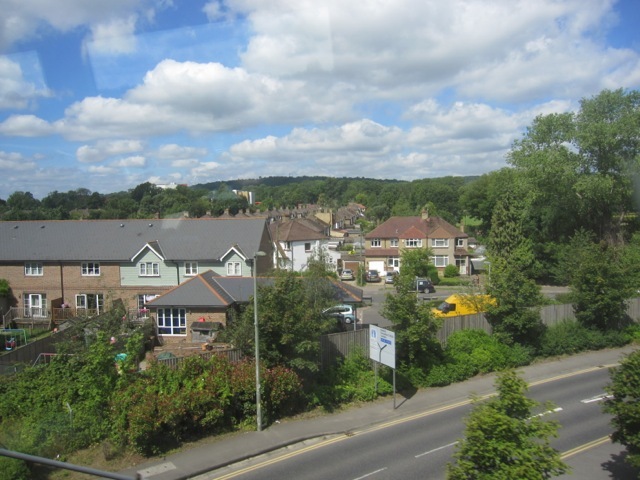 We wandered the town a bit until Hope Newcomer picked us up and toured us around West Sussex before taking us to her charming house. Her husband, Andrew, and two of her daughters, Ellie and Grace, were there also. Andrea is in the states for the summer. The Newcomer-Jones took us to a great little restaurant on the Arun River and close to the English Channel -- a few blocks from their home. Tomorrow we are going to go to the castle. This was a lovely day. This is a lovely place! And, I'm writing this from my room in the hotel. It is late afternoon, and I decided to take a break from all the touring and visiting and busyness to simply sit, write, and relax. This is the very first time I have done this other than the end of each day when we say goodnight and go to our rooms. It was time that I took some space for myself. This has been a really nice trip and a nice visit. But, I'm ready to relax a bit while Connie is out there still roaming. We will meet for dinner. We began today with the second of the bus tours in town -- the one that stays in town and gives an over view of all the various sites to visit. This time the tour was excellent because I had my own ear plugs and our guide was great. 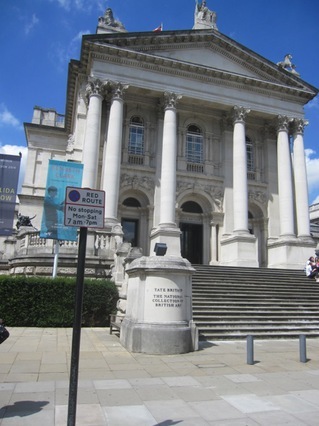 After we toured for several miles, we jumped off at the stop that was by the Fashion Museum and the Assembly Rooms. 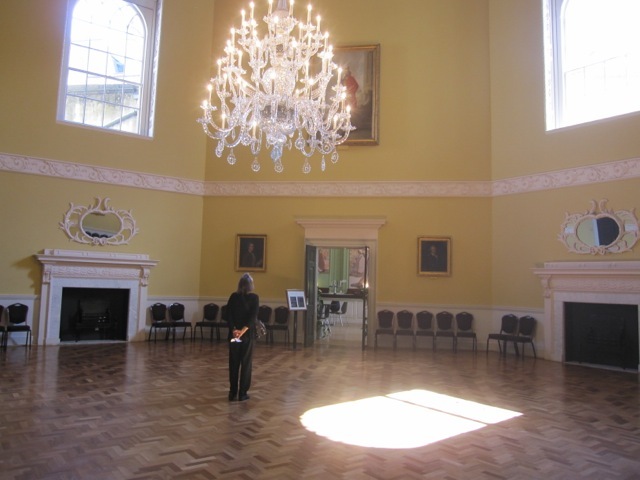 The Assembly Rooms were used in the 18th century for parties, card games, teas, and dances by high society. 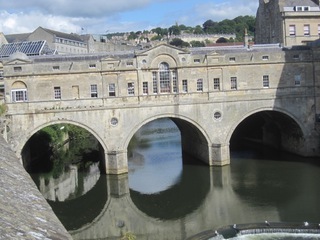 These rooms are actually mentioned in a couple of Jane Austen novels since she lived here for a few difficult years when her father was ill and died. 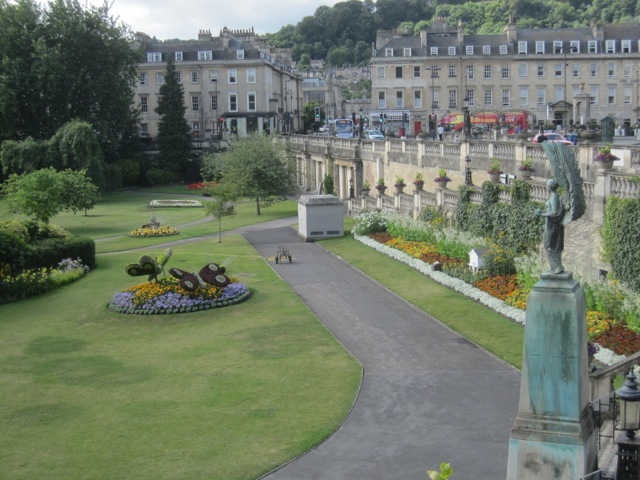 But, she also wrote two of her novels in Bath. We didn't tour her home since it is not actually where she lived. But, the halls are beautiful, although one was closed for a private party. They have been restored after being bombed in the war. The Fashion Museum is a fascinating exhibit of four centuries of fashion. It also has a presentation of the "Dress of the Year" which I had never heard about. Evidently one designer dress is chosen each year to represent the best of design. This museum has a display of those that have been chosen over the years. We also walked over to the circular Neo Classic buildings called the Circus. There's one on each side of a square which, all together, resemble a coliseum. 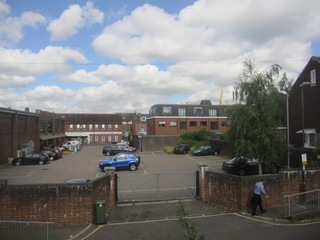 All the fronts are similar, but the backs are not -- and some have "hanging loos" which were added years later since none of the apartments had them when built. 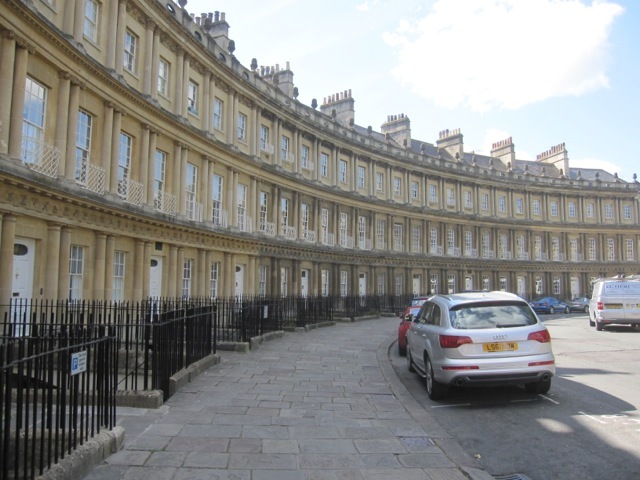 We began walking down Milsom Place, a good shopping venue, and Connie found a new blouse. 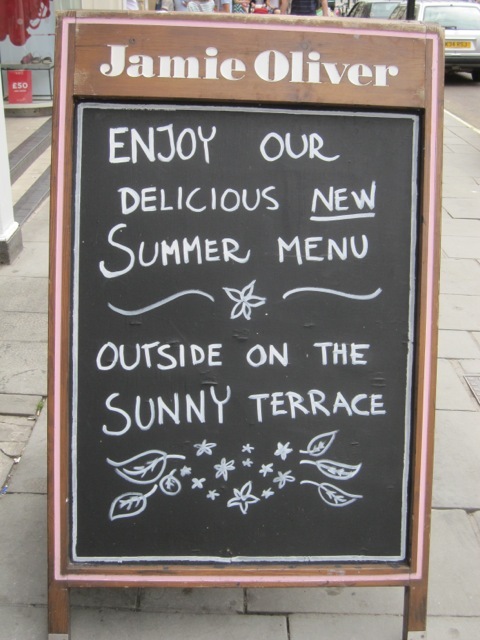 I was delighted because I found Jamie Oliver's Italian restaurant. Jamie is one of the chefs responsible for changing the reputation for Britain's cuisine. According to one of his workers, this is the first deli and restaurant that he has built in England. We had to go in and have lunch -- which, by the way, was delicious! I think Connie was pleased! After eating, we caught the rest of the bus tour which took us back to the city center. We followed the tour with a walk through the Bath Abbey where King Edgar I was crowned in 973. Today's abbey is the last great medieval church in England. 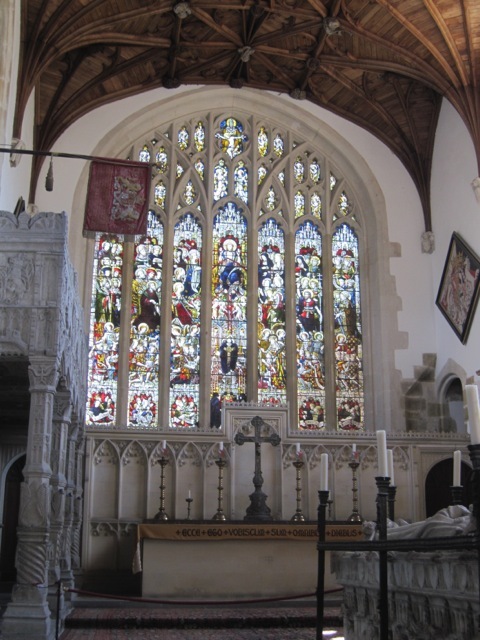 It has so much stained glass that it is nicknamed "The Lantern of the West." 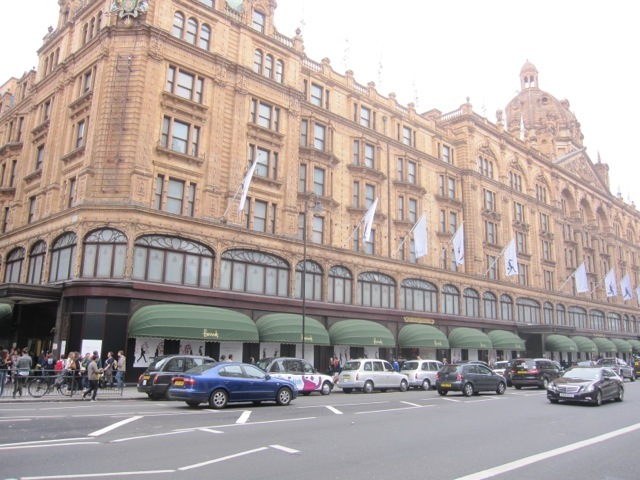 A trip through a few stores brings us up to this afternoon when I am writing this post. I'm lying on my lovely white comforter with the fan going in my room. It isn't hot, but it is pleasant with the moving air. 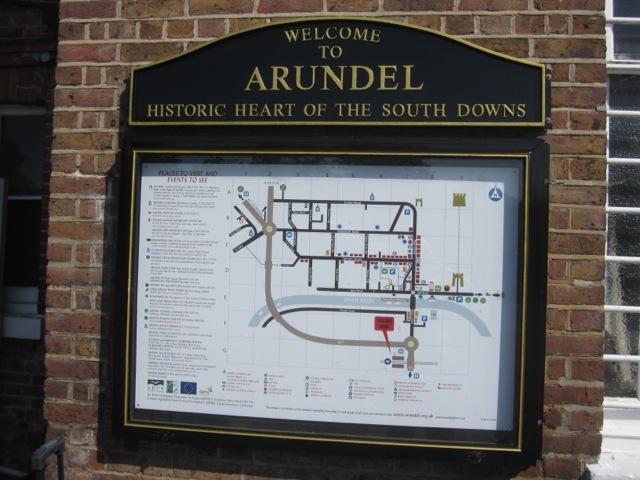 Tomorrow we have train tickets to West Sussex and a town called Arundel. One of the Assembly Rooms Mentioned in Jane Austen's "Persuasion." Guess What I Found Walking Down Milsom Place? 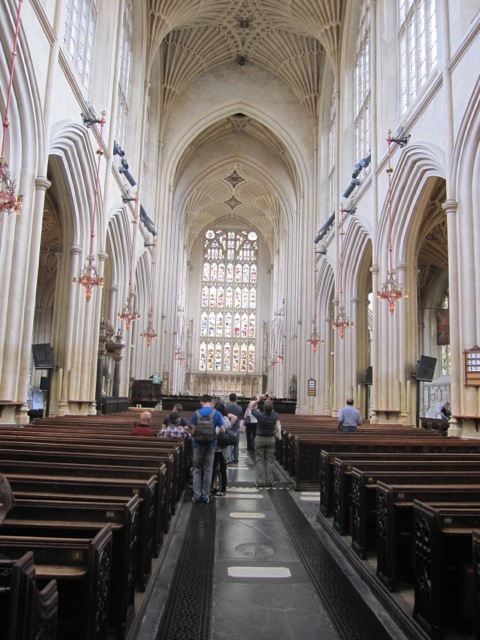 I have written and lost this little post about Bath three times. I'm going to try to save every other sentence! 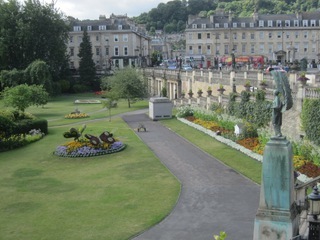 We arrived in Bath on Sunday morning, just before noon, after a 1 1/2 hour lovely countryside train ride from London. 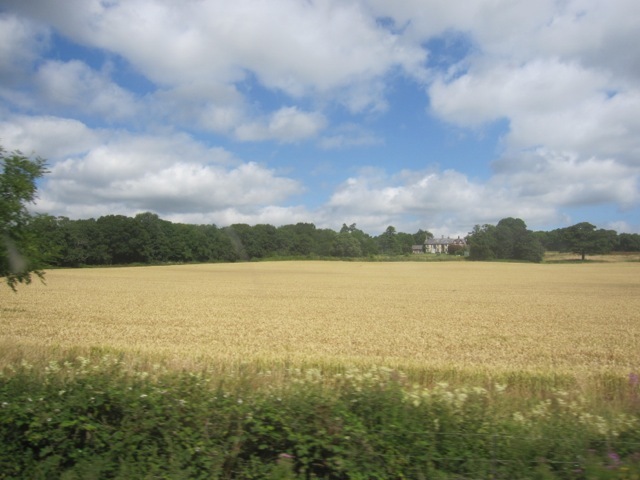 We saw lots of wheat fields and animals grazing as well as a nuclear plant. Somehow it didn't quite fit. Unfortunately, we had a bit of a mixup with our hotel hosts who didn't expect us until 2:00. So, Connie and I dragged our suitcases even a bit further to a pub where we had a passable lunch. My hamburger was fine, I was just tired and needing to get settled, and completely in the dark as to when the hotel owners would be located. They do not reside in the building and have other businesses. I left messages by phone but hadn't heard back. After lunch, Connie went back by the house and found some people leaving who let her in. She called me and I followed -- and we finally connected with the owners. 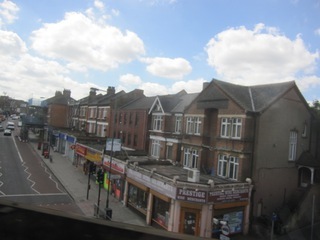 After getting settled in our lovely rooms (no complaints there), we set out for a bus tour of the outskirts of town. My earphones didn't work well, so I just had to pretend to know what I was seeing. 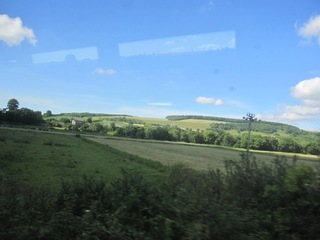 However, the top of the bus was quite balmy and the trip lovely through the hills around Bath. I resolved to take my iPhone plugs the next time. 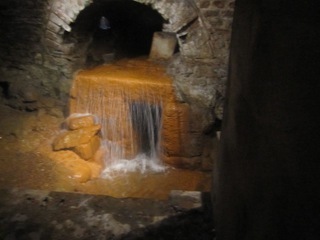 After the tour, we headed for the Roman baths and a wonderful, and quite comprehensive, tour. 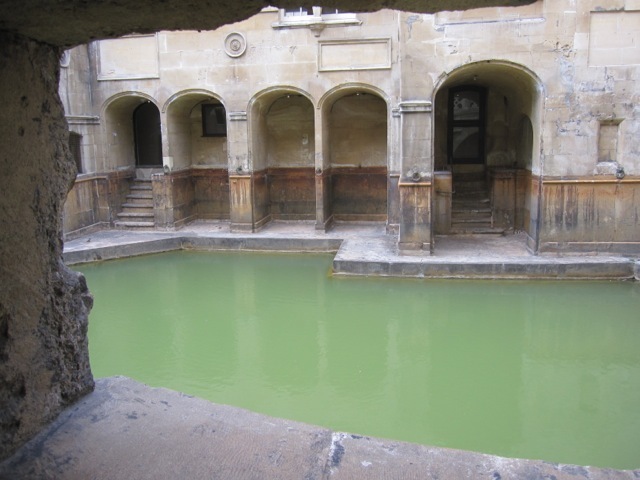 The baths are many centuries old, but the self guided tour takes us through the Roman city of Aquae Sulis which contained many pools bubbling up from the deep with supposedly healing warm waters. 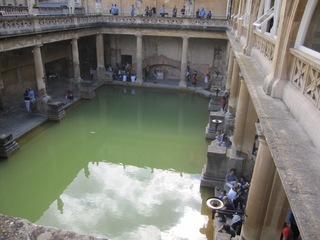 How the Romans ended up in Britain in the 1st century is a mystery to me, but they obviously were there for the baths. 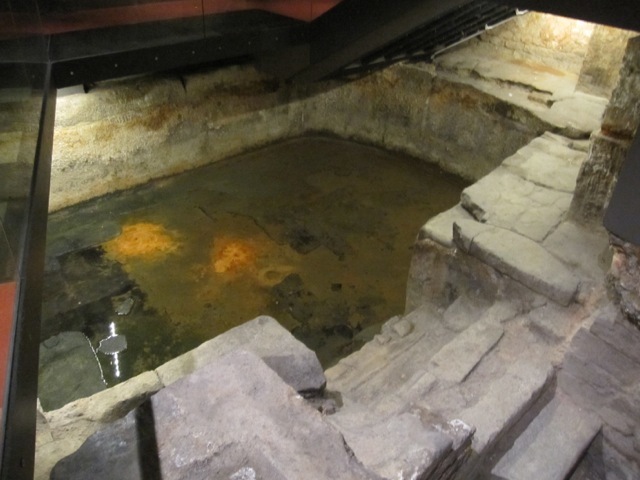 A great deal is known about their culture and habits, and the tour takes you through items found from their times - the Roman ruins being at least 18 feet below the more contemporary dirt floors. The baths have waxed and waned in popularity. In 1687, the supposedly infertile Queen Mary bathed here and gave birth to a son 10 months later which revitalized the area. Today the town is filled with ancient buildings made of the creamy limestone called "Bath stone." 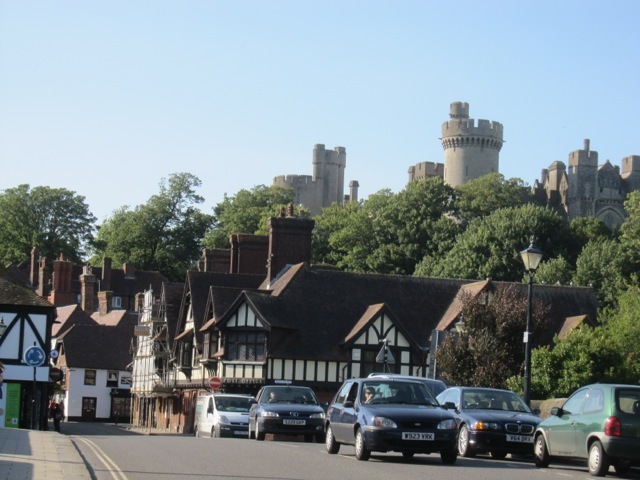 It has more government protected buildings per capita than any other town in England. It is a pleasure to walk through the cobbled streets and peer up at the multiple chimney pots right out of Mary Poppins! After the tour, we found a restaurant and had dinner. I might say that it wasn't our best culinary day. I also have to say that not all Brits make a great roast beef and Yorkshire pudding! Our accommodations are lovely -- nice linen, a fantastic shower, and I even have a queen size bed since I ordered an en suite room. There are only about six rooms in this building which is narrow and tall. Connie is on the upper-most floor with a tiny room. We have no complaints. The breakfast was good -- better than the Celtic. They surely feed you well in Britain. I woke up at 9:00 this morning. I couldn't believe how long I slept. I went down to breakfast after they closed, but the nice waitress served me anyway. Connie was at her place packing to join me at the Celtic since we had decided to stay one more night after lodging wasn't available in Bath until Sunday evening. It was another lovely day which began at the Courtauld Gallery at Summerset House which is a beautiful Neo Classical building on the River Thames. Connie's sister, Amy, had mentioned that it had a wonderful collection of Impressionists and she was right. It was a little gem of a museum reminding me a bit of the Isabella Stewart Gardner in Boston. We toured the top floor, then ate lunch in a little cafe housed in another wing of the building, and finished up on the second and first floor with some Medievel and Renaissance art. The whole experience was peaceful and lovely, and the museum was not crowded with tourists. 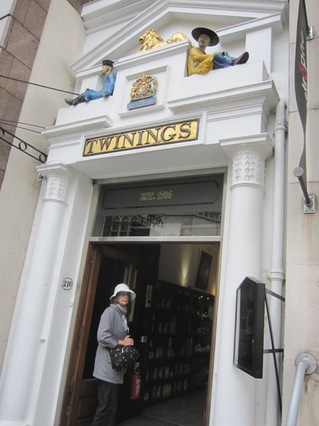 From there we walked around central London with thousands of other Saturday shoppers until just after 5:00 when we met Dani and Charles's friend from their Yale days, Cindy Paces and her two lovely daughters for tea at a hotel in Covent Gardens. Cindy came to Bellingham when Charlotte was about six months and Mariel was about eight. She also happened to be in Singapore when I was visiting -- so she reminded me that we now have had tea on three continents. We returned to the hotel and wandered out about 8:00 p.m. to a little Italian place around the corner for a bit of pasta to round off the evening. While there, I was telling Connie about how the Boston museum had been robbed, and the woman next to us told us which paintings had been stolen. She is a Londoner, deals in art with a degree from USC. Her husband is Swiss and she proceeded to tell us a great deal about the art world in London. It was a serendipitous end of a lovely day. Tomorrow we catch the train to Bath. I should have gone to bed earlier last night because I was so tired that it took me ages to get to sleep. Today I have either been feeling jet lag, the lack of sleep, or just plain weary from all the excitement and sightseeing. The breakfasts at my hotel are plentiful, but not wonderful. I have yet to figure out the best thing to eat. 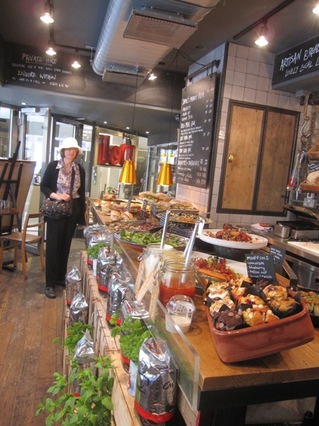 There are eggs several ways, English bacon or sausage, grilled tomatoes, a variety of cereals, toast and marmalade or jam. You can have as much as you want. But, I'm not crazy about their eggs or bacon -- although they are acceptable. Tomorrow I might try the sausage. The toast and tea are great! Connie and I took off this morning for Westminster Abbey and bought a two hour tour. Of course, it was packed on a summer day. The tour guide for 20 people was loquacious and very knowledgeable but after one hour of standing around on concrete listening to every story in the book about the people buried in the tombs and the lowdown on all the royalty, I began to yearn for places to sit down. I wanted to sit still in that absolutely amazing space which contains so much history and contemplate. The clergy say a prayer every hour which was too short and left me wanting more. I wasn't the only one in the group who got weary -- by the time the tour was over, the group was down to about 12. I was able to sneak away while keeping my eye on the group and rejoining from time to time. Connie did the same thing in her own way. Finally, we snuck out and went to the little abbey cafe and had a sandwich and a Coke. We were hot and thirsty. Next time, I must remember to get a self conducted tour -- but it was a fabulous place to go on a rainy day. 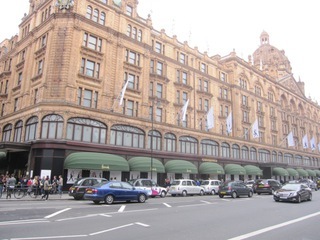 We left the abbey, headed over to Harrods, and had tea and dessert before walking through several departments especially the food court. We decided not to buy any of the beautiful sweaters and purses we saw on sale since they cost the equivalent of our airline tickets. Both Connie and I were struggling physically to keep going, so we turned towards our hotels and spent a few hours alone until dinnertime came around when we walked over to a little Spanish restaurant which was delightful. We were the only ones without reservations, but the owner let us in when we promised to be done in 1 1/2 hours. We both had a lovely meal, walked around for a bit, spent some time sitting in one of the many parks around Russell Square, and headed back to an early evening's rest. 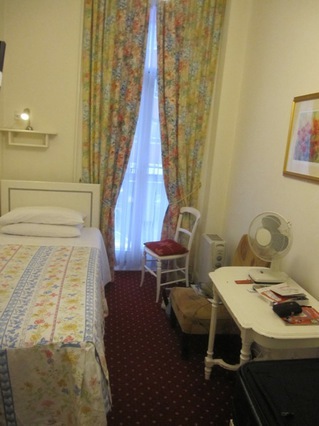 I had originally requested an en suite room and the hotel had a cancellation, so I came back to a new room. Not much larger, but there is an actual toilet behind a little sliding closet door. Quaint perfectly describes this hotel. And, also nice and pleasant. I'm comfortable which is all I want to be. Tomorrow an art gallery and high tea with some friends. Life is indeed good -- even when I'm struggling to fit into a lifestyle that does not involve an automobile or even clear directions about how to get from Point A to Point B. As I mentioned before, I am in awe of London's transit system, prefer the buses to the underground just because of the view, and think I am just going to barely scratch the surface this time around. 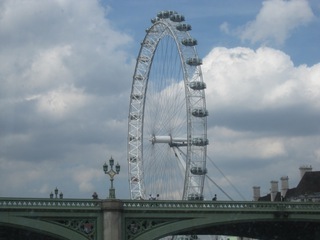 It is nice just saying I'm in London. 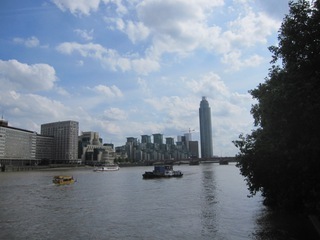 Even if I were just sitting here in the hotel lobby doing nothing, it is nice to be in London. I have been reading British mysteries since I was 20 years old starting with Agatha Christie. I have probably watched more British series than most Brits, and surely I drink as much tea. It's just nice to finally be in London. And to order a pot of real English tea. 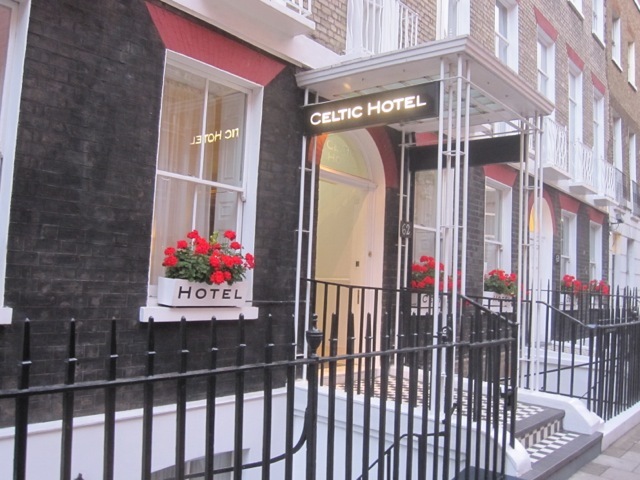 I'm happily settled into my sweet little hotel room at the Celtic one block from Russell Square which is in Bloomsbury around the corner from the British Museum. 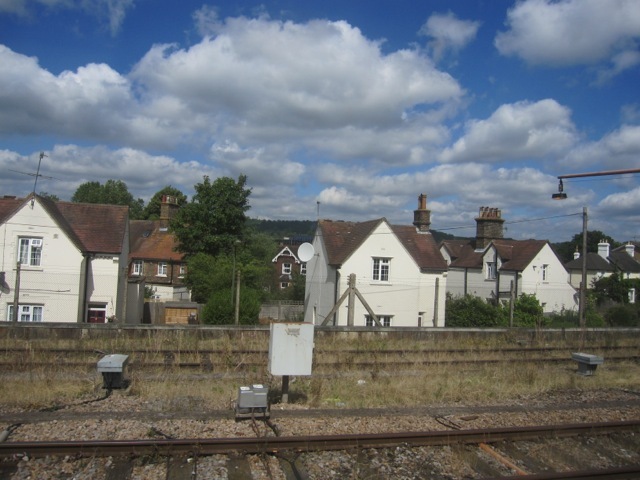 It is a central place to be, and a modest place to stay. My room isn't much larger than a dorm room, but it is clean and has every amenity that I need. The people are very accommodating and the breakfasts are ample. My niece, Connie, is just about three blocks away in University dorm rooms. Yesterday, I flew into Heathrow and took the Express to Paddington Station where Connie met me. 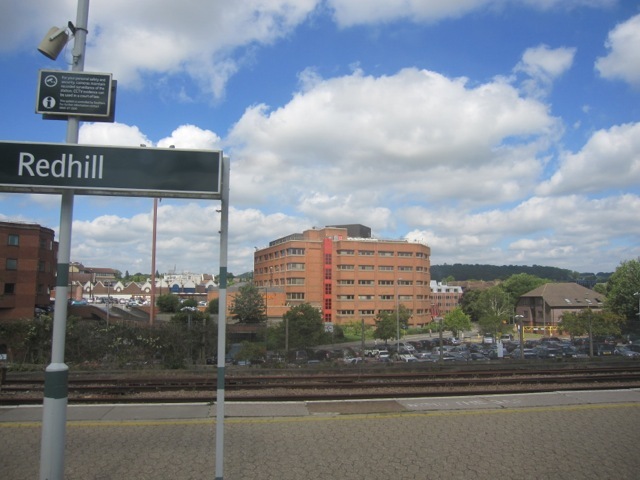 We had a bowl of chili and a cider in a station pub then took a taxi to my hotel. We spent the afternoon riding a tour bus around the city (good for me with only three hours sleep on the plane and not yet adjusted to the change of time). 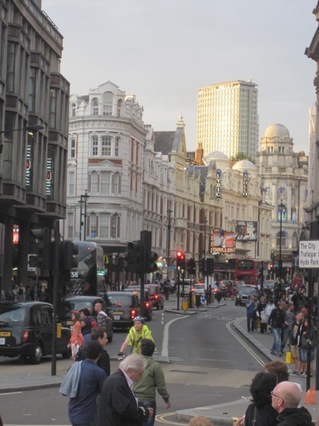 Then we returned to Russell Square, had dinner in a crowded neighborhood pub, and walked back to the hotel for a full night's sleep. This morning I had breakfast and Connie joined me for a coffee. Then, we took off for the British Museum where several government workers were on strike and picketing, and a few exhibits were closed inside. But, most rooms were open, and we spent about four hours meandering until it was time for lunch which we ate across the street in a little outdoor restaurant in Russell Square. Then we hopped a bus over to Trafalgar Square and to the National Portrait Gallery which was just amazingly enjoyable. I felt that I got to meet in person people that I've read about for years. I wish I lived close by so I could hear a Shakespeare play or read an historical novel and run down to the gallery to see what the people actually looked like. About three, we went up to the top floor restaurant and bar where we sat and had tea and cake before touring the more modern part of the museum. At the end of the day, we hopped the tube into Soho and went to Nopi which Martin and Dani both insisted that I visit. 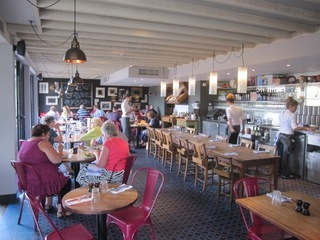 Nopi is one of four restaurants owned by Israeli chef, Yotam Ottolenghi, who has made a big culinary splash with his books "Plenty" and "Jerusalem." I found the latter when I was eating lunch one day at Ciao Thyme and bought it. I had made reservations early that morning and it was well worth the trip. We had a delicious and interesting dinner with creative appetizers (one was Vegetable crudités with a red pepper dip, and the other called a Valdeon cheesecake with pickled beet room, hazelnut and honey). I had the pork chop and Connie ordered the Sea Bass. 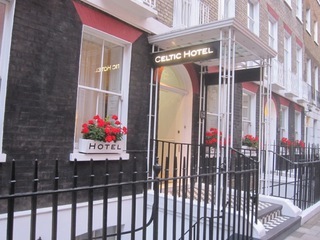 After dinner we wandered a bit through Soho streets and then hopped a few buses back to Russell Square and our hotels. I must say that the tubes are fascinating, but I prefer the buses. First, it is amazing to watch how they maneuver through the horribly crowded London streets and second, I enjoy the sights which you miss on the tube. However, I am fascinated by the sheer amount of people that London moves with its efficient transportation system. It boggles the mind. Tomorrow will be a new day. 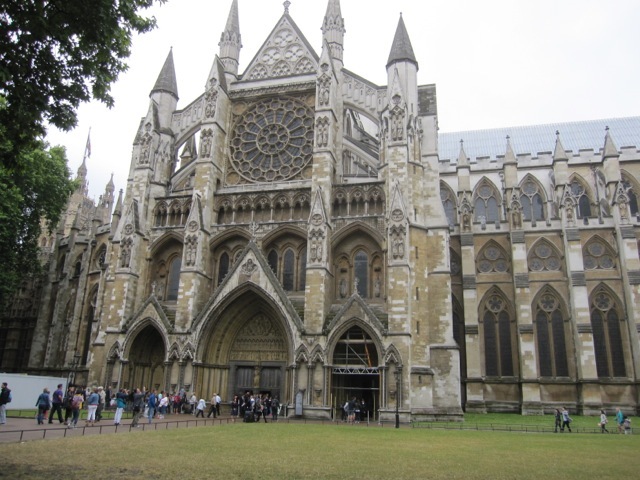 Since I walked over seven miles today, I trust that I can still walk tomorrow because we are taking a tour of Westminster Abbey in the morning and I'm hoping to find a few stores later in the day. Connie wouldn't mind going back to Nopi, but I have some other restaurant possibilities in mind. I'm also moving my room tomorrow since my little cubby hole has a sink and shower but no loo. They had a cancellation so for two days I'll have my own en suite. More later. But, here are a few pictures: (By the way, Martin had to delete the response button on my blog -- so you can't post a response -- but you can always email me at marilyn@donel.net. Do the Brits still use these???? I am missing Fred Meyer. For those of you who live elsewhere, it is a store akin to Target -- one stop for all your needs. But, Fred Meyer decided over a month ago to begin selling guns. I was meandering around the hardware department in one of their two Bellingham stores looking for sandpaper and wondering where the toys went. They had remodeled, and I wanted a new jigsaw puzzle. Imagine my surprise when I came across a huge display case filled with small handguns and two children standing in front of the glass mesmerized by the merchandise at their eye level. Designer guns. Pink as well as the standard black. There were rifles higher up in back of the case and further up behind the entire display were the bikes. I guess this was Freddie's new sporting goods department. It's not as if I am totally anti-gun. As a child, I made my own rubber guns out of wood and a clothespin and along with the other children on my street, I shot at critters. I'm sure I had more than one cap gun. My dad owned an air gun and we shot the pellets from time to time at various targets in our back yard. I think my mom sold that gun after he died. I never bought a toy gun for my children, although they like all children simply used their two fingers and imaginary weapons when needing to shoot their imaginary enemies. Now, of course, most children's action figures shoot for them. In fact, figures without action seem to be passé these days. Fred Meyer prides itself on being a family store. They even have family checkout stands that do not have candy or items that tempt children to drive their parents crazy saying "NO!" We, we are not a city that deprives those who wish to buy weapons. In fact, stores like WalMart even cater to children by selling "starter shotguns." Since we have a WalMart in Bellingham and other sporting goods stores that sell guns to hunters (and criminals, too, I am sure), I don't know why Fred Meyer has to jump on the bandwagon. Well, actually, I do. Statistics show that more and more women are buying guns to protect themselves. I guess they might prefer pink so that their murder weapon will match their outfit. It escapes me as how such a store as Fred Meyer that claims to care about families, in the wake of all the pain of the school shootings that are so fresh in the minds of every human that cares about the welfare of children, would begin to sell guns at this time. Furthermore, why they would artfully display them in a glass case at the level of a six year old and in close proximity to bikes and not far from toys. That, to me, does not say "Family Store." That says "Anti-Family Store" because a great deal of pain is caused by guns that are readily available to disturbed humans. What on earth has happened to our nation that we allow such nonsense? For these reasons, I have not been back to Fred Meyer except to take a picture of the display which I was too shocked to take on the day I first saw it. When the young girl who was selling the guns asked me if she could assist me, I told her she most definitely could not. And, I walked out for the last time. It is difficult. I am sad. Sad for our nation. Sad that I can't go back to one of my favorite stores. Sad that my car keeps wanting to turn into their parking lot. Sad that I have to keep reminding myself not to automatically run over to Fred Meyer. But, somehow we all have to make some kind of statement. Perhaps it will make me feel better. I doubt whether or not that it will even affect Fred Meyer. 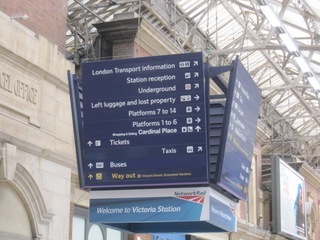 I'm going to London! Yes, I really am going to London after so many years of talking about it. I don't know why it has taken so long. Perhaps it is because my traveling abroad has been to other places -- following Dani and Charles twice into Asia plus a trip to the Holy Land and places around with Don's mom and friend, Peggy. Lots of traveling here and there, but except for a touch down in Ireland and a landing in Greece on my way to and from Israel, I haven't seen Europe. My roots are in England. My mother was born there as were her parents. So, when Don's niece, Connie, wrote on Facebook that she was taking her break from the Peace Corps in Moldova to spend time in England and would someone like to join her, I simply said "Yes." That was it -- no thinking, no planning, no worrying, no pondering, no fear -- just YES! All the thoughts and organization (Yikes!) came after. First, my passport was expiring two weeks after my return which caused me to get an expedited passport for my comfort level since traveling so close to expiration date could cause some minor problems. That took me to Seattle twice in one week. I picked it up yesterday and had my second lovely lunch with Martin who works on 5th Avenue five blocks from the passport office. Lucky me! Then, a scramble to get lodging in July, a fury of emails between Connie and me, and the purchase of a new Mac Air because I swore that I would never ever travel again with my heavier laptop. Yes, I know I don't actually need a computer but I can Skype home for free. 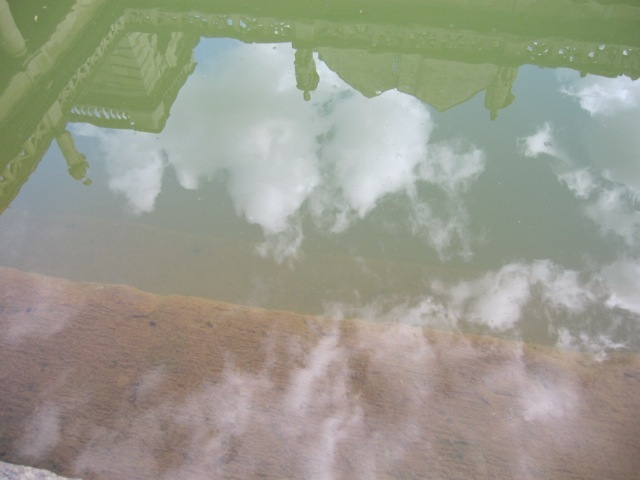 I've been looking at this trip as a "dip your toe in the water" kind of experience. I know that I can't see and do everything in nine days. And, I know that if I were going by myself I would spend all my time in museums and having high tea. But, then bookstores, cathedrals, gardens, plays would run a close second. But, I suspect that Connie will like much of what I like. My foodie kids have been giving good advice for restaurants that I simply cannot pass and some experiences that I mustn't miss. I love the fact that none in my whole family has suggested that I see the changing of the guard or Buckingham Palace or any of the more common touristy stuff. We must all have the same DNA. Actually, I think that being in the same country as the queen and her family is cozy enough for me. 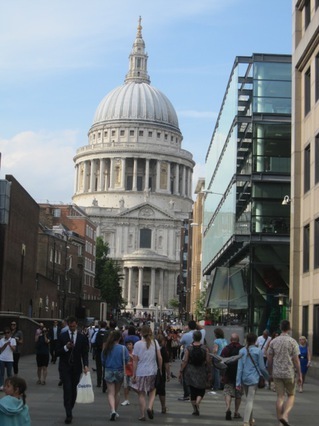 And, I know I mustn't miss Westminster Abbey or St. Paul's cathedral. 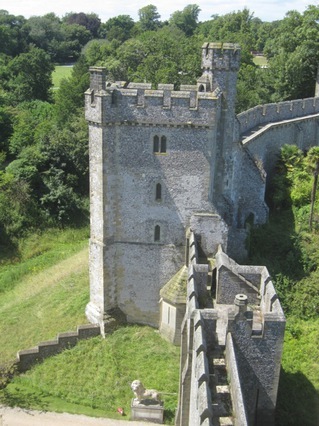 Connie and I will be in London for five days, then to Bath for two nights, and to Arundel for two nights. My friend, Hope Newcomer, lives in West Sussex and is going to show us around that area including the Arundel castle. 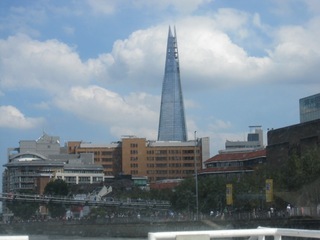 We return to London the night before we board our planes back to Bellingham and Moldova. 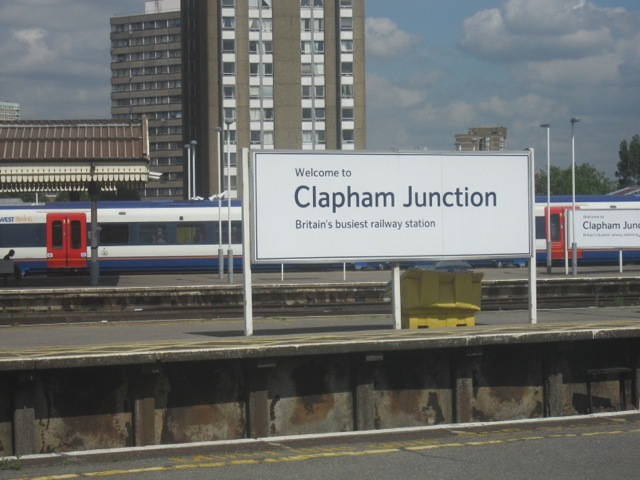 I'm a bit nervous about the places we have booked in London because they are not luxury by any means. I'm only hoping that the beds are comfortable and that traveling to a bathroom down the hall in the middle of the night isn't too gruesome. But, we will see how that goes. Nothing in the world could be as uncomfortable as the dorm room that Dani, Charles, James, Nico and I shared in Macau for two nights. If I got through that, I think perhaps I can get through anything. Charles was lecturing at the University and they were supposed to put us up in a hotel -- and somehow that got changed at the last minute. The rooms, themselves, were stripped down and not terrible -- but the beds were boards. It was a difficult decision to stay the second night -- but Dani and I decided that we could do it. And, we put all our effort into touristy things. So, I'm off next week to London. I'll keep you posted.